Apple Pay is a payments feature integrated into the Wallet® app on your iOS device that lets you add your BOM Visa® debit cards to Apple Pay to make purchases at participating retailers in stores, using Near Field Communication (NFC) technology, or in app. To add your eligible BOM Visa® debit cards to Apple Pay, follow the Apple Pay instructions(Opens Overlay). Apple Pay provides the same benefits and protection as your physical card, with the convenience of making secure transactions on your iOS device. Use Apple Pay anywhere contactless payments are accepted and to make purchases in app with participating apps. For additional details, see the Apple Pay instructions(Opens Overlay). You can use Apple Pay in stores on your iPhone® 7, iPhone® 7 Plus, iPhone® 6, iPhone® 6S, iPhone® 6 Plus, iPhone® 6S Plus, and Apple Watch™ with compatible iPhone 5 or later. Apple Pay can also be used in-app with your iPhone® 7, iPhone® 7 Plus, iPhone® 6, iPhone® 6S, iPhone® 6 Plus, iPhone® 6S Plus, iPad Air™ 2, iPad Pro, iPad mini 3, and iPad mini™ 4. Apple Pay is integrated into the Wallet app, which comes pre-installed on your eligible iPhone® 7, iPhone® 7 Plus, iPhone® 6, iPhone® 6S, iPhone® 6 Plus, iPhone® 6S Plus, iPad Air® 2, iPad Pro®, iPad mini® 3, and iPad mini® 4. You will be given an opportunity to configure Apple Pay upon setup of your new device. If you already have established an iTunes® account, the credit card that is on file will be made available to you to immediately upon Apple Pay setup. You will have the ability to add additional eligible BOM Visa® debit cards by using the iSight® camera to instantly capture your card details or by entering them manually. 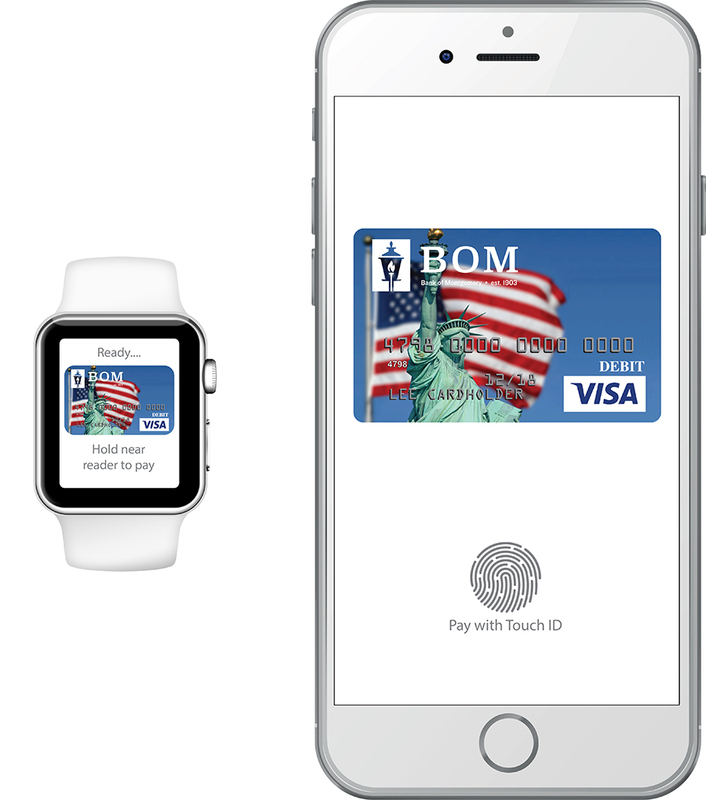 Please note, Apple Pay on the Apple Watch will not be set up through Wallet. You can load your BOM card to the Apple Watch app on the paired iPhone. An alert will be displayed on the watch upon card activation. To make an in-store purchase with your iPhone® 7, iPhone® 7 Plus, iPhone® 6, iPhone® 6S, iPhone® 6 Plus, or iPhone® 6S Plus, just hold your device near the contactless reader with your finger while holding down Touch ID™. A subtle vibration and beep will confirm the transaction is complete. To make an in-store purchase with your Apple Watch, double-click the side button and hold the face of your device near the contactless reader. A gentle pulse and tone confirm that the transaction is complete. To make a purchase in-app with your iPhone® 7, iPhone® 7 Plus, iPhone 6, iPhone 6S, iPhone 6 Plus, iPhone 6S Plus, iPad Air 2, iPad Pro, iPad mini 3, or iPad mini 4, select Apple Pay as the payment option in the app and place your finger on the Touch ID. Is there a fee associated with using a BOM Visa® debit cards with Apply Pay? A: There is no cost for Apple Pay from BOM; however, an active data plan is required. Based on your wireless plan and mobile carrier’s offering, additional message and data charges may apply. BOM does not charge any fees to add your BOM Visa® debit cards. Can an Apple Pay token be used for recurring charges, subscriptions or bills (Netflix, Amazon Prime, etc.)? These Terms for Adding Your BOM Visa® debit cards to a Digital Wallet (the “Terms”) apply when you choose to add a BOM Visa® debit cards Digital Wallet (“Wallet”). In these Terms, “you” and “your” refer to the cardholder of the BOM Card, and “we,” “us,” “our,” and “Bank of Montgomery” refer to the issuer of your BOM Visa® debit cards, which will be Bank of Montgomery. Adding Your BOM Visa® debit cards. You can add an eligible BOM Visa® debit card to the Wallet by following the instructions of the Wallet provider. Only BOM Visa® debit cards that we indicate are eligible can be added to the Wallet. If your BOM Visa® debit card or underlying account is not in good standing, that BOM Visa® debit card will not be eligible to enroll in the Wallet. When you add a BOM Visa® debit card to the Wallet, the Wallet allows you to use the BOM Visa® debit card to enter into transactions where the Wallet is accepted. The Wallet may not be accepted at all places where your BOM Visa® debit card is accepted. Your BOM Visa® debit card Terms Do Not Change. The terms and account agreement that govern your BOM Visa® debit cards do not change when you add your BOM Visa® debit card to the Wallet. The Wallet simply provides another way for you to make purchases with the BOM Visa® debit card. Any applicable interest, fees, and charges that apply to your BOM Visa® debit card will also apply when you use the Wallet to access your BOM Visa® debit card. Bank of Montgomery does not charge you any additional fees for adding your BOM Visa® debit cards to the Wallet or using your BOM Visa® debit card in the Wallet. The Wallet provider and other third parties such as wireless companies or data service providers may charge you fees. BOM is Not Responsible for the Wallet. BOM is not the provider of the Wallet, and we are not responsible for providing the Wallet service to you. We are only responsible for supplying information securely to the Wallet provider to allow usage of the BOM Visa® debit card in the Wallet. We are not responsible for any failure of the Wallet or the inability to use the Wallet for any transaction. We are not responsible for the performance or non-performance of the Wallet provider or any other third parties regarding any agreement you enter into with the Wallet provider or associated third party relationships that may impact your use of the Wallet. Contacting You Electronically and by Email. You consent to receive electronic communications and disclosures from us in connection with your BOM Visa® debit cards and the Wallet. You agree that we can contact you by email at any email address you provide to us in connection with any BOM account. It may include contact from companies working on our behalf to service your accounts. You agree to update your contact information with us when it changes. Removing Your BOM Visa® debit cards from the Wallet. You should contact the Wallet provider on how to remove a BOM Visa® debit card from the Wallet. We can also block a BOM Visa® debit card in the Wallet from purchases at any time. Governing Law and Disputes. These Terms are governed by federal law and, to the extent that state law applies, the laws of the state that apply to the agreement under which your BOM Visa® debit card is covered. Disputes arising out of or relating to these Terms will be subject to any dispute resolution procedures in your BOM Visa® debit card agreement. Ending or Changing these Terms; Assignments. We can terminate these Terms at any time. We can also change these Terms, or add or delete any items in these Terms, at any time. We will provide notice if required by law. We can also assign these Terms. You cannot change these terms, but you can terminate these Terms at any time by removing all BOM Visa® debit cards from the Wallet. You may not assign these Terms. Notices. We can provide notices to you concerning these Terms and your use of a BOM Visa® debit card in the Wallet by posting the material on our website, through electronic notice given to any electronic mailbox we maintain for you or to any other email address or telephone number you provide to us, or by contacting you at the current address we have on file for you. You may contact your local branch, click here for branch locations. Questions. If you have any questions, disputes, or complaints about the Wallet, contact the Wallet provider using the information given to you by the provider. If your question, dispute, or complaint is about your BOM Visa® debit cards, then contact your local branch, click here for branch locations.